The Global Volcanism Program has no activity reports for Suchitán. The Global Volcanism Program has no Weekly Reports available for Suchitán. The Global Volcanism Program has no Bulletin Reports available for Suchitán. Volcán Suchitán, NE of the city of Jutiapa, is one of the largest volcanoes in SE Guatemala. The summit of the andesitic-to-basaltic stratovolcano is elongated in a N-S direction. Several large canyons cut the slopes of the dominantly andesitic edifice. A large parasitic cone, Cerro Mataltepe, is located on the upper N flank; two smaller cones are located on the lower N flank. Two Holocene basaltic lava flows are located on the N and NW flanks (Williams et al., 1964), and many flank vents are basaltic. The volcano was constructed immediately E of the 5-km-wide basaltic-to-dacitic Retana caldera, formed in part in association with the eruption of a dacitic pumice deposit. Steep walls 60-250 m high rise above the flat caldera floor. One of the latest basaltic lava emissions flowed through a low notch in the eastern caldera rim. Several lava cones and a maar are located along a N-S line N of Retana caldera. A reported eruption in 1469 is considered to have actually been from Atitlán volcano in the Guatemalan highlands. Williams H, McBirney A R, Dengo G, 1964. Geologic reconnaissance of southeastern Guatemala. Univ Calif Pub Geol Sci, 50: 1-62. There is no Deformation History data available for Suchitán. There is no Emissions History data available for Suchitán. The elongated Suchitán volcano, seen here from the west on the rim of Retana caldera, is the highest of a cluster of closely spaced small stratovolcanoes and basaltic cinder-cone fields in SE Guatemala. 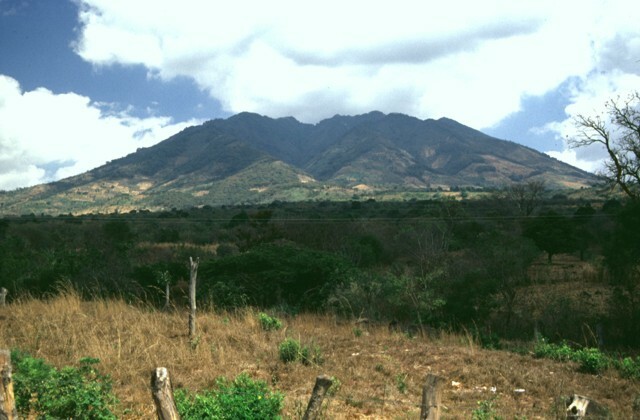 The large peak to the left of the 2042-m-high summit of Suchitán is Cerro Mataltepe; other cinder cones occur lower on the north flank. One of the latest lava flows from Suchitán traveled through a low notch in the east rim of the caldera. 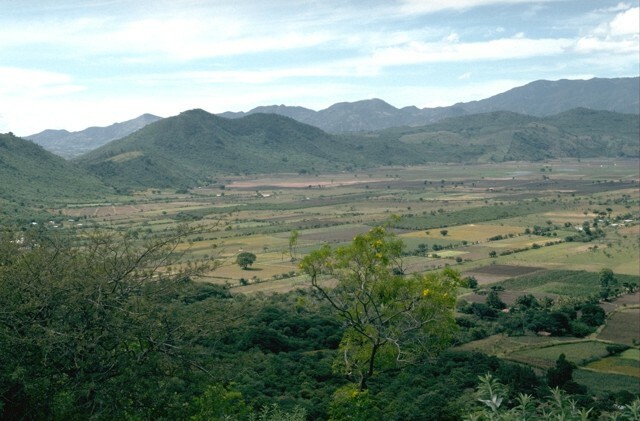 The flat-bottomed floor of Retana caldera once contained a lake, but now is used for agricultural land. 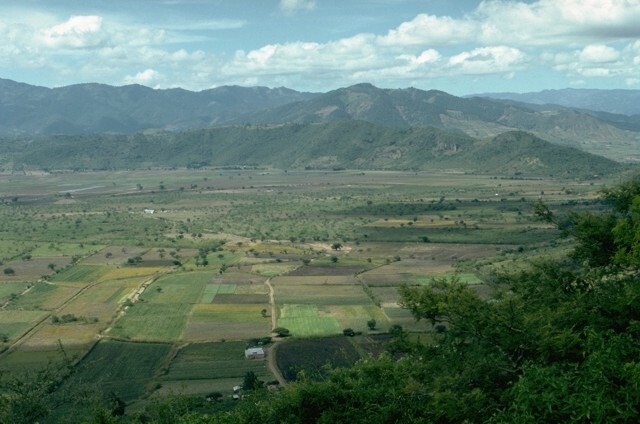 The flat floor of the 5-km-wide Retana caldera between Suchitán and Tahual volcanoes is now used for farmland. The steep-sided caldera walls range up to 250 m in height, and a low notch on the northern rim (left-center) drains the caldera. The caldera was considered to have formed mainly by subsidence; the volume of dacitic pumice and lithic fragments associated with caldera formation is insufficient to account for the 1.5 cu km volume of the caldera. Retana caldera, between Suchitán and Tahual volcanoes, is a prominent steep-walled caldera once filled by Laguna Retana. The lake periodically became dry and was refilled in the 19th and 20th centuries and has now been drained to provide access to rich soils on the lake floor. A canal drains the lake through a notch on its northern rim (extreme right). The caldera is seen here from its eastern rim (on the flank of Suchitán volcano). Volcán Tahual is the forested volcano behind the caldera at the right-center. 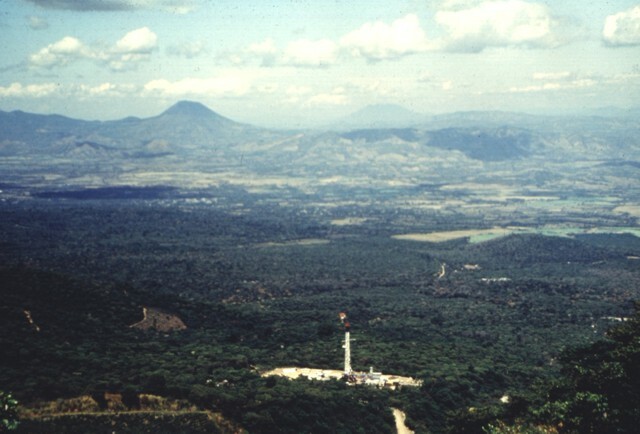 This view from the Apaneca Range shows the CH-A well and drill rig of the Ahuachapán geothermal field in the foreground. 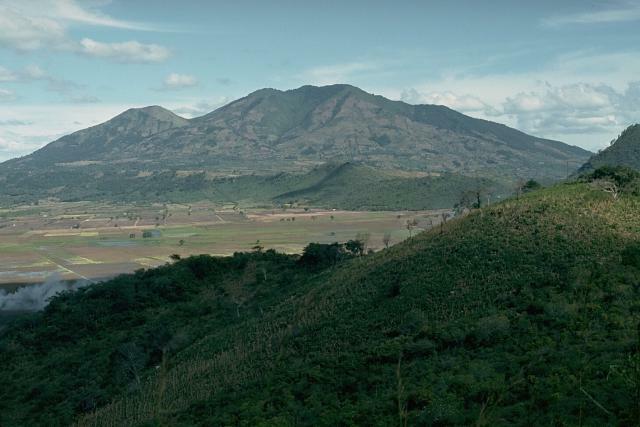 The conical peak on the left horizon to the north across the lowlands of El Salvador's interior valley is Volcán Chingo, along the El Salvador/Guatemala border. The flat-topped peak in the far right distance is Volcán Suchitán in Guatemala. Photo by Comisión Ejecutiva Hidroeléctricia del Río Lempa (CEL), 1992. The irregular summit ridge of Volcán Suchitán is seen here from the SSW, west of the city of Asunción Mita. The largely andesitic stratovolcano rises 1100 m above its base and is one of the largest in SE Guatemala. The stratovolcano is extensively eroded, and large canyons cut its slopes. Two basaltic lava flows of estimated Holocene age were erupted from vents on the northern and NW flanks. Photo by Giuseppina Kysar, 1999 (Smithsonian Institution). 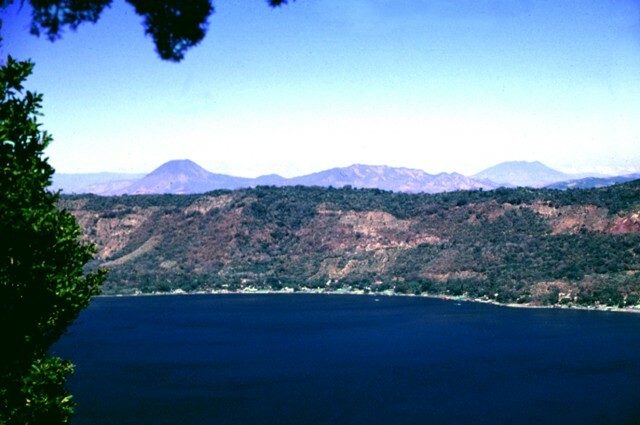 The northern wall of Coatepeque caldera rises about 250 m above the surface of Lago de Coatepeque, whose shores are lined with residences and small hotels. The conical peak on the left horizon is Volcán Chingo, which straddles the El Salvador/Guatemala border. The flat-topped peak on the far right horizon is Volcán Suchitán, one of the largest volcanoes in SE Guatemala. Publisher: Instituto Geografico Nacional "Ingeniero Pablo Guzman"
There are no samples for Suchitán in the Smithsonian's NMNH Department of Mineral Sciences Rock and Ore collection. Large Eruptions of Suchitán Information about large Quaternary eruptions (VEI >= 4) is cataloged in the Large Magnitude Explosive Volcanic Eruptions (LaMEVE) database of the Volcano Global Risk Identification and Analysis Project (VOGRIPA).